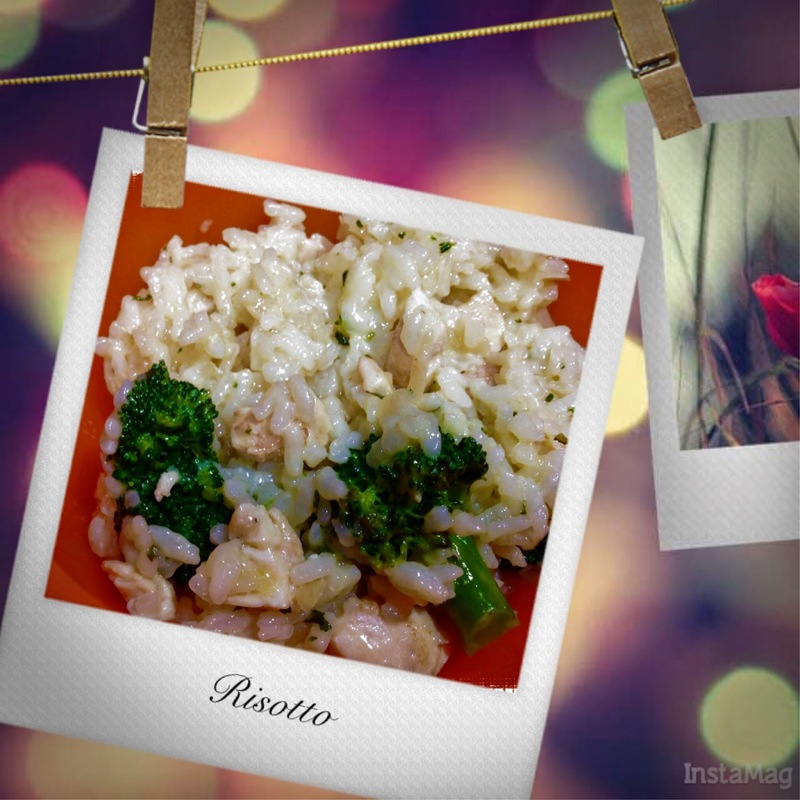 Ivy cooked the cheesy risotto based on Wolfgang Puck's recipe above except she used chicken and broccoli instead of mushroom and reduced the servings to 2. With a damp towel, wipe the mushrooms clean. With a small, sharp knife, trim off tough or dirty stems. Then, cut the mushrooms into thick, uniform slices. Put the rinsed and drained rice in a bowl. Drizzle with 1 tablespoon of the olive oil and stir well to coat the rice evenly. Put the rice in the rice cooker. Add 2 cups of the broth along with the wine, and 1½ teaspoons of salt. Stir well. Close the lid of the rice cooker and press the “Cook” button. Cook for 20 minutes, and then switch the control to the “Keep Warm” setting. While the rice is cooking, heat the remaining 1 tablespoon of olive oil in a large, heavy skillet over medium heat. Add the onion and cook, stirring frequently, until tender, about 5 minutes. Add the garlic and sauté, stirring continuously, for 1 minute. Add the mushrooms, ½ teaspoon salt, and pepper to taste. Raise the heat to medium-high and cook, stirring continuously, until the mushrooms are juicy and tender, 5 to 8 minutes. Remove the skillet from the heat. Taste and, if necessary, adjust the seasonings with more salt and pepper. Set aside. Carefully open the lid of the rice cooker. Stir in the sautéed mushrooms, ½ cup of the broth, the butter, parsley, and Parmesan. The mixture should have a creamy consistency; but, if it does not, stir in up to another ½ cup of the broth. Continue stirring for about 1 minute longer; then, taste and adjust the seasonings again, if necessary. Spoon the risotto into heated wide, shallow bowls or soup plates. Serve immediately, passing additional Parmesan at the table for anyone who would like more.